You can help your patients quit smoking. 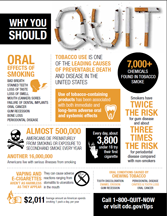 As a dental hygienist, you see smoking-related damage in your patients’ mouths every day. Because you are a health care provider, your patients trust your advice and knowledge. ADHA and the CDC’s Tips from Former Smokers® campaign have partnered up to help you talk to your patients about quitting tobacco use. If you missed our September webinar, “Motivational Interviewing Techniques to Help Patients Quit Tobacco Use,” you can download the recording here. The webinar post-test is available here. 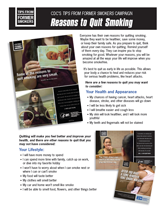 If your practice has a website, you can include the link to the CDC’s How to Quit Smoking webpage. Let your patients know they can also get FREE help by calling 1-800-QUIT-NOW (1-800-784-8669) or 1-855-DÉJELO-YA (1-855-335-3569).